Alder kitchen cabinets are characterized by light brown and reddish undertones. Alder has a straight and even-textured wood grain with indistinct boundaries between the heartwood and the sapwood. Alder has a stable staining surface. Alder and Rustic Alder wood is softer and moderately light in weight. Extra care should be taken, as it can dent and mar easily. Rustic alder kitchen cabinets have a more dramatic grain and may contain a variety of pin holes, open and closed knots of various sizes and colors, small cracks, worm holes, worm tracks, bird pecks, mineral streaks and grain variations. Some knots may have holes up to approximately ¾-inch in diameter through the panel. 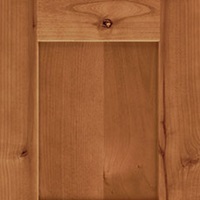 The holes created by open knots can pass completely through the cabinet door. The larger holes remain unfilled in order to contribute to the desired rustic look.